Udupi, Oct 22, 2017: Speaking at the Police Martyrs’ Day programme organised at Chandu Maidan Udupi on Oct 21, Saturday, Deputy Commissioner Priyanka Mary Francis said that coordination among different departments while discharging administrative duties is essential for the hassle-free administration. 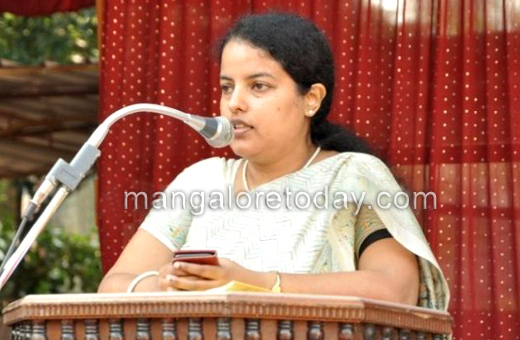 The Udupi DC also said that shirking responsibilities by the departments will not yield better governance. There is a need to change the mindset of the officials and it is necessary to work in coordination with each other, she added. She said the police department is not the only department responsible for the happenings in the society. The pressure on the police is immense as the public approach them for all reasons from potholes on the road to family problems. A country, like the US, offers helplines, but in India it is difficult. The work burden should be judiciously shared by all the stakeholders in the administration including the district administration. She added that police are suffering from the complicated problems of maintaining law and order. Hence there is a need for separate division of the law and order maintenance and detection of crimes. Lamenting the death of police personnel owing to insufficient protection, the DC added that the society should support police personnel in the combat operations. “Police people die because weapons are insufficiently provided. Hence the death of policemen are increasing. She called for women-friendly policing and urged the police personnel to be compassionate while attending to the women complainants. She said the women who come to police station should be treated with respect. Superintendent of police Dr Sanjeev Patil said 370 personnel have lost their lives while on duty from July 2016 to August 2017 in the country, of which 12 are from Karnataka. Patil said that the police martyrs are remembered for their invaluable service to the cause of nation. The day is observed to respect the sacrifice of ten police men against the Chinese soldiers during 1959 at Hot Springs at the China border. As many as nine were captured alive by Chinese soldiers. The bravery of the policemen is commemorated every year, he informed. In Mangaluru too, Police Martyrs Day was observed with DK DC Sasikanth Senthil, IGP (Western range) Hemant Nimbalkar and others offered their tribute to the martyrs.